A group of travellers evicted from a Peterborough car park have moved a few yards up the road to another Peterborough City Council car park. The caravans had been parked at the Key Theatre/Crown Court car park since Tuesday, January 18. 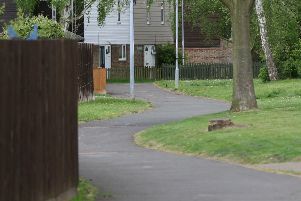 On Wednesday, they were ordered to move on from the land following a hearing at Peterborough Magistrates’ Court. They were given 24 hours to leave the car park - which had remained open while the caravans were parked - before bailiffs would attend. The caravans moved from the Key Theatre car park on Thursday - only to move to neighbouring Bishop’s Road Car Park. A council spokesman said: “Eviction proceedings have begun this morning. The travellers are the same group who moved onto the Key Theatre Car Park. “We have to start the eviction proceedings again, as the orders passed this week only apply to a specific piece of land. “The orders remain in place for a number of months, so they will not be able to return immediately to land they have been evicted from. “Orders have to relate to a specific piece of land, so they cannot be in place for other car parks.